Fast and Easy Keto Goodness! Is there a better combination than chocolate and peanut butter? Let me answer that for you.. NO!! The best thing about this combo is that it can be made keto friendly relatively easily. That’s just what we did here with our tasty 4 ingredient Low Carb Peanut Butter Balls. There are a couple things to keep in mind when cooking up these delicious low carb peanut butter balls. The first thing is the type of peanut butter you use. 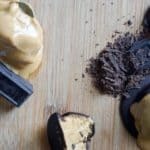 Peanut butters come in all shapes and sizes and the main thing you want to be conscious of in this recipe is the consistency of your peanut butter. Depending on the consistency you will need more/less almond flour. For this recipe we used equal parts almond flour and peanut butter, and the peanut butter we used was an oily all natural one. If you use some of the more homogeneous JIF types of peanut butter you will not need as much almond flour. Next let’s talk chocolate. We use a 100% cocoa bakers chocolate for the coating. We love this stuff, but it is relatively bitter since there is no sweetener added. We add sweetener to the filling and find that this chocolate provides a good balance to the sweetness of the filling, but if you want a traditional sweet dessert you will want to add a sweetener to the chocolate! A few drops of stevia or a tablespoon of erythritol should be perfect! Forming the balls is straightforward, but there are a couple things to keep in mind. The main thing is the temperature of the peanut butter and the chocolate. You want the peanut butter to be ice cold. It will warm up as you begin rolling it into a ball by hand. Don’t roll it for too long of the ball will become too soft! The chocolate should be melted but not overly hot. Again, if the chocolate is too hot the peanut butter will get too soft and not hold shape. The main goal is the get these puppies coated and into the fridge while keeping the peanut butter as cold as possible! Combine peanut butter, almond flour and sweetener. Combine well. Place peanut butter mixture into freezer for an hour. Melt bakers chocolate in microwave or double broiler. Roll frozen peanut butter mixture into balls. Insert toothpick into balls and coat in melted chocolate. Place chocolate coated peanut butter balls into fridge to harden. Store in fridge.